The dramatic ruins of Wingfield Manor stand on a hill above the village of South Wingfield, which lies around 3 miles from the town of Alfreton in Derbyshire. The extensive medieval manor house was built in around 1450, the site of a twelfth century castle, for the wealthy Ralph de Cromwell, 3rd Baron Cromwell, (c.1393 – 1456) Chancellor of England during the reign of King Henry VI. Cromwell was a man of great power and influence, and as a young man had accompanied Henry V on his campaigns in France and had fought at Agincourt. At the time of its construction Cromwell's palace at Wingfield was one of the largest and most lavish in England. After Cromwell's death, Wingfield Manor was purchased by John Talbot, second Earl of Shrewsbury (c. 1417 – 1460). 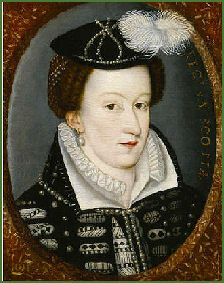 During the reign of the last Tudor monarch, Queen Elizabeth I, George Talbot, sixth Earl of Shrewsbury (1528 – 1590) and his wife the formidable 'Bess of Hardwick' were entrusted with the care of the Queen's cousin and rival claimant to the English throne, Mary, Queen of Scots, during her captivity in England from 1569 onwards. Mary was housed in several of his properties in Derbyshire, including Wingfield. During the English Civil War (1642–48), the manor, which is located in what was then a strategic position near a main north-south artery of the country, was owned by John Talbot, 10th Earl of Shrewsbury (1601 - 1654), a supporter of Parliament. The Manor was captured by Royalist forces under the Earl of Newcastle in 1643 and following a siege, was retaken by Parliament in 1644. Wingfield Manor was partially demolished at the end of the Civil War was later sold to the Halton family, (originally from Greystoke in Cumberland) one of whom was the astronomer, Immanuel Halton. The Halton's carried out repairs on the main buildings around the Great Hall, inserting floors and windows, and occupying that area for the next hundred years, with the rest slowly deteriorated around them. The fabric of the building was later further damaged when stone was taken for building nearby Wingfield Hall. The vast and immensely impressive ruins are arranged round a pair of courtyards. The remains which survive to the present day include part of a tower which stands 22 metres (72 feet) high , before the English Civil War, the tower had one of the earliest flushing systems in England. A cistern of water, positioned at the top of the tower, was emptied through the toilet area into the moat. The remains of the gothic great hall, which now stands roofless, are still impressive, with its long range of windows. it was once one of the largest in the country, the hall contains a superb oriel window, (pictured right) which would once have contained coloured glass. The superb vaulted undercroft (pictured right) below the great hall was used to store wine, beer and food, and had stairs on each corner going up to the great hall. The columns that support the roof and the buildings above spread into a vaulted roof with decorative traceried bosses. Just inside the doorway to the undercroft, a number of medieval mason's marks are still visible. The kitchens were connected to the great hall by a passageway. The remains of two bread ovens are still visible, as are two large fireplaces. There is also a great stone barn, notable for the internal timbering and probably the oldest building on the site. The gate above the entrance to the north court contains a carved representation of moneybags, the symbol of the exchequer, Lord Cromwell. Along the curtain walls and on the towers the damage caused by cannonballs during the Civil War can still be seen. One in particular, on the north wall, shows by its shape, the direction of fire, indicating the direction of the cannons used in the 1644 siege, four 32 pounders, borrowed for the occasion. Initially these cannon were positioned on the hill to the east, the site of an old Roman fort, but the distance was too great and the only damage incurred was to a half moon battery outside the main gate, which is overgrown but still visible. Wingfield Manor is now in the care of English Heritage, there is a working farm at the centre of the complex of buildings and ranges. The manor may be viewed by pre-booked guided tours one Saturday a month during the Summer. There is no parking available on the site. Visitors are advised to park in the lay-by on the Crich Road, approximately 300 yards from the site entrance. In March 1569, Mary Queen of Scots, while in the custody of George Talbot, sixth Earl of Shrewsbury became severely ill with what was termed at the time as "grief of the spleen", symptoms which her doctor attributed to "windy matters ascending to the head". Mary was therefore moved from the draughty and exposed Tutbury Castle to the more comfortable prison of Wingfield. During her stay the Queen's suite of apartments were traditionally on the west side of the north court, she enjoyed occasional rides and hawking with Shrewsbury, and even had up to ten horses, three grooms and a farrier at one point. She obtained a greyhound, several small dogs, caged birds from France, turtle doves and barbary fowls. She was also allowed to practice archery and lute-playing, and she even introduced a billiard table for the benefit of her household. In August 1569 the Earl of Shrewsbury was anxious to move Mary from Wingfield to Sheffield because the manor required cleaning. There were over 240 people in residence and the manor "waxed unsavoury." Shrewsbury had two houses at Sheffield, Sheffield Castle and Sheffield Manor and could easily move the queen between them when cleaning was necessary. Mary was still staying at Wingfield at the time of the Rebellion of the North in November 1569, when the Earl recieved news of a plot to release Mary. The Earl of Northumberland was staying at nearby Wentworth House. The alleged escape plot involved his wife, the Countess of Northumberland pretending to be a nurse and coming to attend Christine Hogg, the pregnant wife of the embroiderer Bastian Pagez. The Countess was to take Mary's place while she affected her escaped. Elizabeth I wrote to the Earl of Shrewsbury on 14 March 1570 giving permission for him to move Mary back to Wingfield because the water supply at Tutbury Castle was inadequate. The Earl had hoped to take Mary to Chatsworth House and also made preparations there. Legend states that Mary had her fateful meeting with Anthony Babington, whose family lived at Dethick nearby, Babington was the ringleader in the abortive Babington Plot, a Recusant Catholic plot against Elizabeth I. The walnut tree in the north courtyard is reputed to have grown from a seed left when Anthony Babington smeared walnut juice over his face to disguise himself and enter the castle to see Mary, Queen of Scots. Unfortunately, the tree is not old enough for this story to be true. Babbington never visited Mary whilst she was kept at Wingfield and only became involved in the plot whilst Mary was imprisoned at Chartley, over the border in Staffordshire, and following her departure from both Wingfield and Tutbury Castle.